While on his second deployment with the 2nd Battalion, 3rd Marines, Corporal Paul Schaus lost both legs after stepping on a landmine during a firefight with insurgents in Helmand Province, Afghanistan on June 5, 2009. Following a mission protecting another squad while it destroyed an enemy bunker, Cpl Schaus and his squad came under enemy fire. For nearly an hour, the mortars and small arms fire continued as Cpl Schaus and his squad held their ground and engaged the enemy at close range. While taking his team to check the flank for enemy movement, Cpl Schaus stepped on a landmine and was critically injured, losing both of his legs above the knees and a finger on his left hand. Life saving measures by his squad readied him for MEDEVAC to Camp Leatherneck, where despite having twice gone into cardiac arrest, Cpl Schaus was able to be airlifted to Landstuhl, Germany. He was eventually transferred to the United States and spent a month at Bethesda Naval Medical Center before finally moving to Walter Reed. While continuing his treatments and therapies at Walter Reed, Cpl Schaus played Sled Hockey on the USA Warrior Hockey Team. 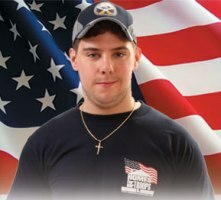 In March 2014 Paul, along with the U.S. Sled Hockey Team and fellow HFOT Veteran Josh Sweeney, won the gold medal during the Paralympics in Sochi. He was also selected to be a torchbearer at the 2014 Warrior Games. Paul is currently training for the 2018 Paralympic Games in PyeongChang, South Korea with the USA Warrior Hockey Team.